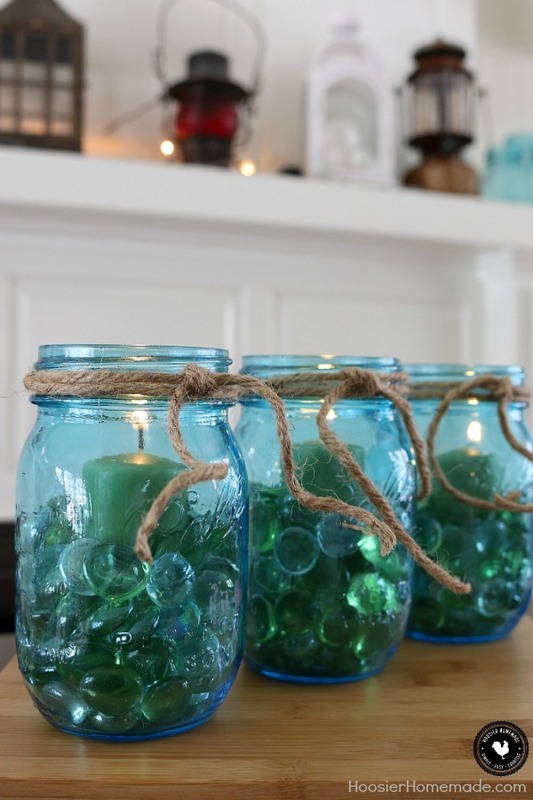 Spruce up your home, decorate for a party or make these easy Mason Jar Centerpieces for gifts. They are quick, easy and take only about 5 minutes to put together. I don’t know about you, but there isn’t a Mason Jar out there that I don’t absolutely love. Decorating with them is simple and easy, and really inexpensive. We have made Mason Jar Vases, painted the Mason Jars, and shared how to make chalkboard labels and turn mason jars into spice containers. And of course, we can’t forget about adding dessert to Mason Jars. The No Bake Cheesecake Trifle is a favorite here and the Caramel Apple Cream Cheese Dip makes a fun gift. 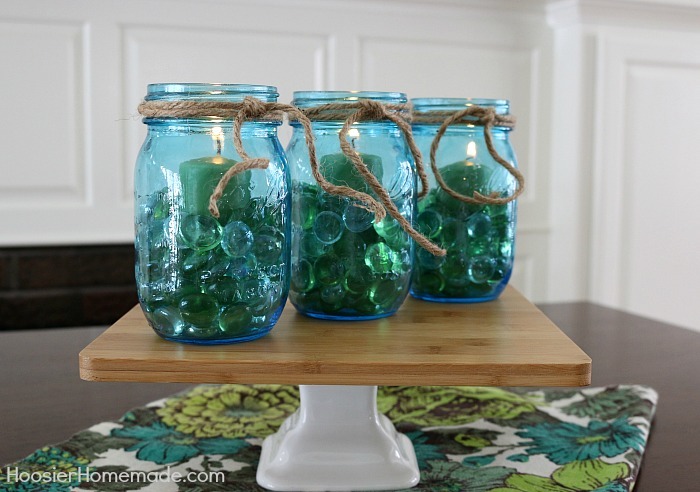 But today, we are chatting about Mason Jar Centerpieces. They are super easy, can be put together in about 5 minutes and you can use them for parties, decorating your home, weddings, gifts and much more! Up first, are the Ball Purple Mason Jars from the Heritage Collection. I think these would be make a gorgeous centerpiece for a wedding. Simply fill with water and add your favorite flowers. 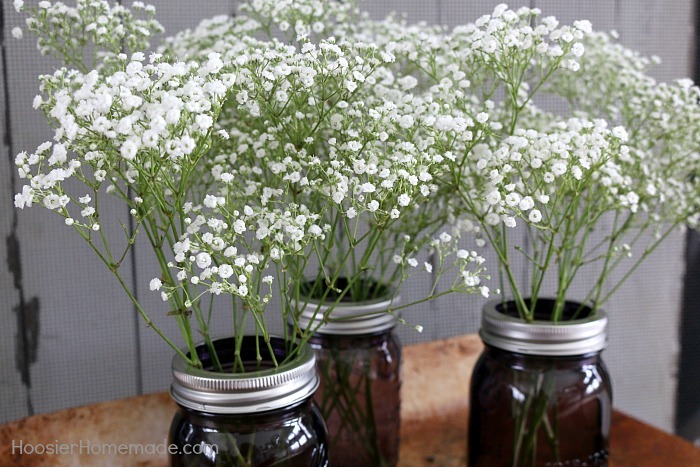 I used Baby’s Breath for a light airy look. 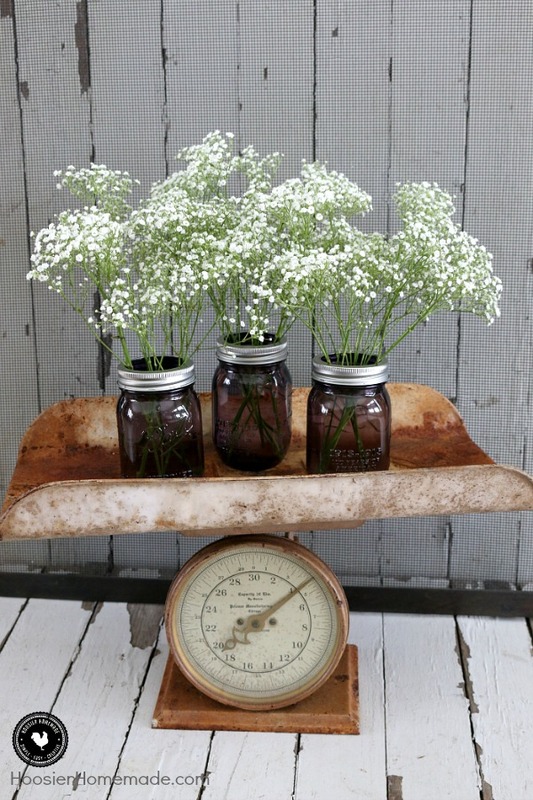 The Ball Heritage Collection Blue Mason Jars are perfect for Spring. I love my Aqua Mason Jars, but sometimes they are hard to find. I love that they are making a new blue mason jar now. For this centerpiece, I wrapped twine around the top rim of the mason jar, tacking it slightly in the back with hot glue. Then I found glass gems in the floral department at Walmart and added those. And finally a simple green votive candle. And finally, the tall 24 ounce wide mouth Mason Jars. I think these fruit filled mason jars would make a pretty table centerpiece for a Spring bridal or baby shower. Or even add them to your table on your deck. 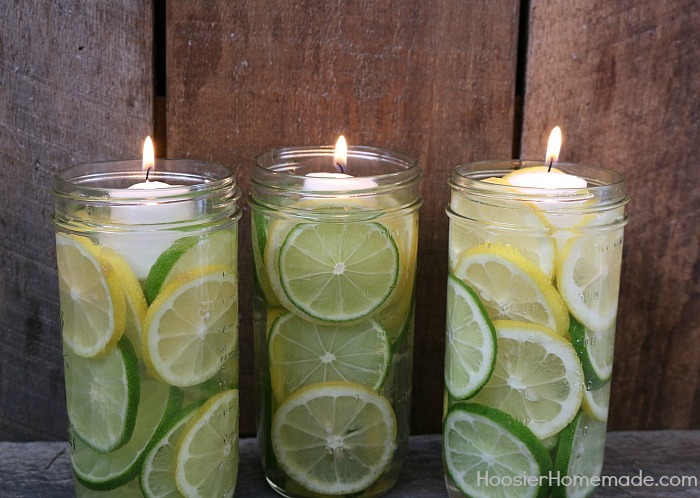 Slices of lemons, limes and water fill the mason jar. Then a floating votive candle. The trick to getting the slices of fruit to look right is to use a pair on tongs to place them in the jar. Hold the jar at an angle and then slide them in. The more fruit you add the easier it is. Then fill with tap water. You can find the Ball Heritage Collection Mason Jars on Walmart.com or in stores. 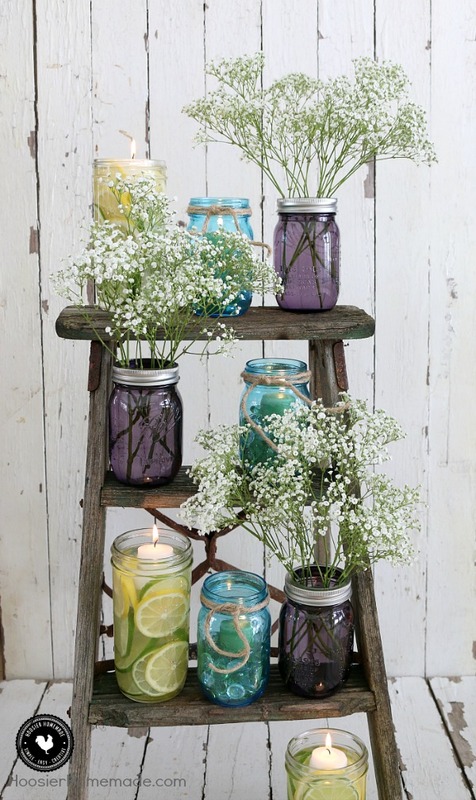 thanks for sharing these pretty mason jars with flowers in them at my party Dream Create and Inspire. 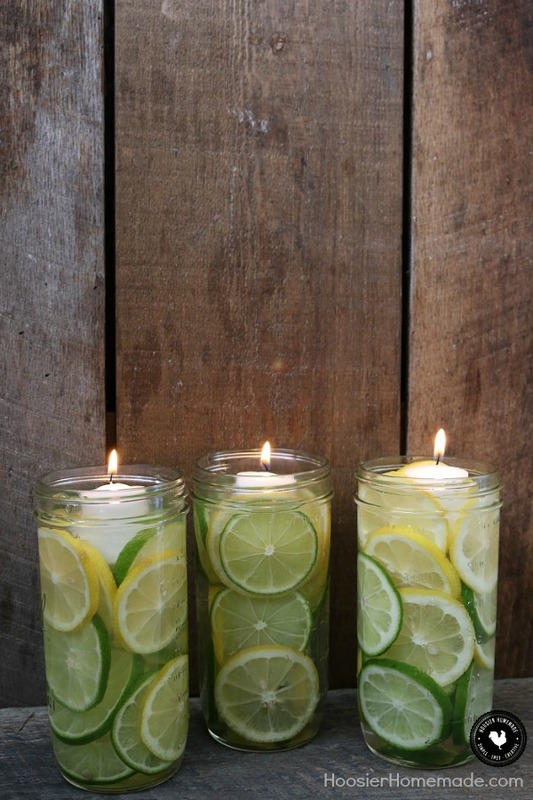 Really love the lemon candle ones. Thank you for sharing it with us at #HomeMattersParty. We would love to have you again next week. Thanks so much Sahana! We will see you there! Great idea for a backyard cookout! Filing this in my minds file for a Graduation party in May. Thanks for sharing! Who doesn’t love Mason Jars! Love the ideas and your creativity! So excited you like the mason jars! Thanks for stopping by! So many great ideas! Thanks for sharing Shelley!